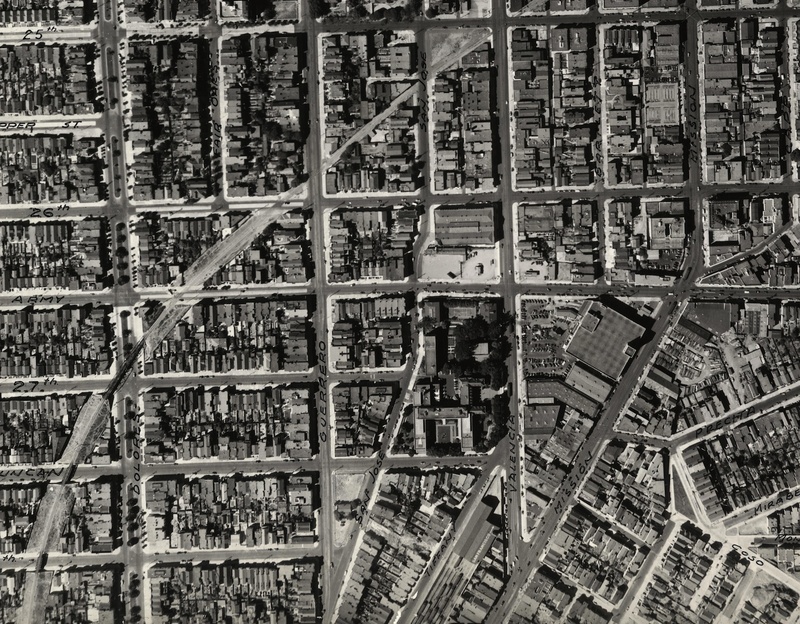 LOOK AT THIS NOW — La Lengua in 1938. 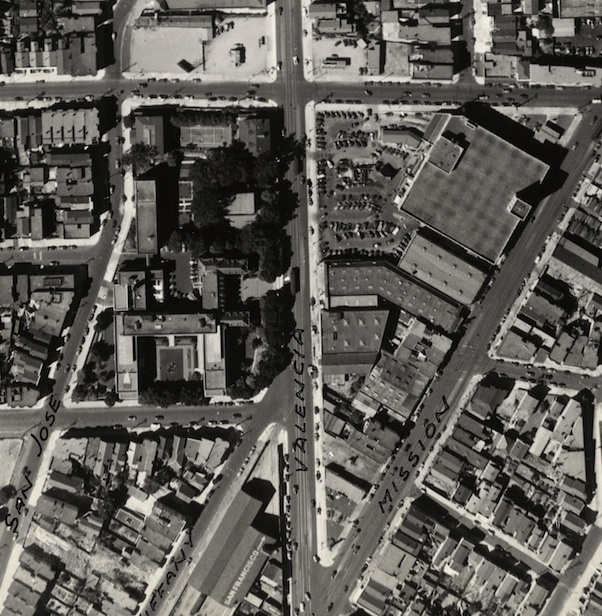 You might as well open a bottle of wine because you’re going to spend the rest of the night looking at these images of 1938 SAN FRANCISCO AS SEEN FROM THE SKY. Yes, you can see the old Southern Pacific Railway trestle bridge across Dolores and 27th. And Sears. And the old St. Lukes building. All hail David Rumsey, scanner of fine maps. 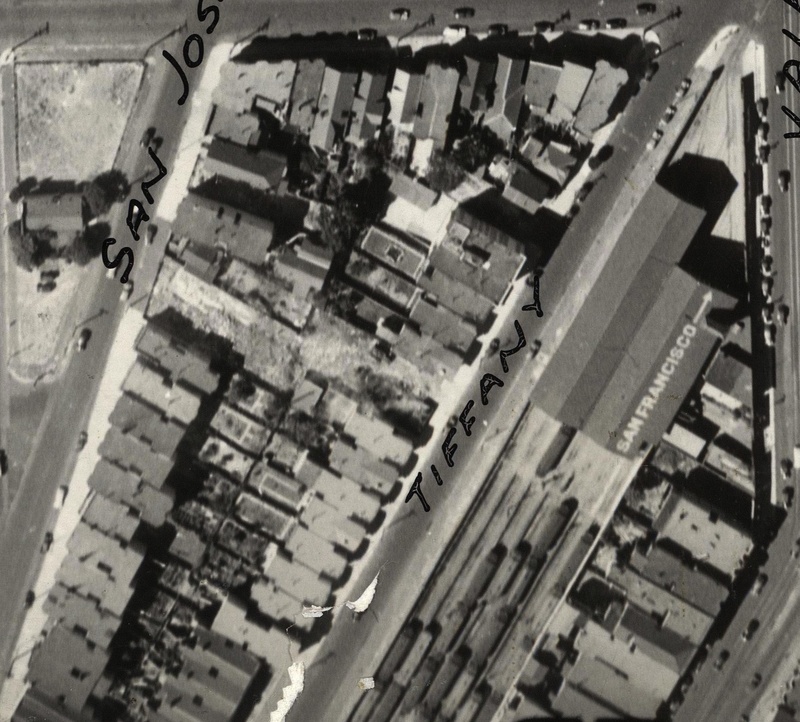 Our friends at the SFPL had a set of aerial photos of 1938 San Francisco stashed away, and Mr. Rumsey aimed his finely tuned scanning equipment at them to drag them forward 73 years. I was lucky enough to be shown these photos in person, and they are simply remarkable. 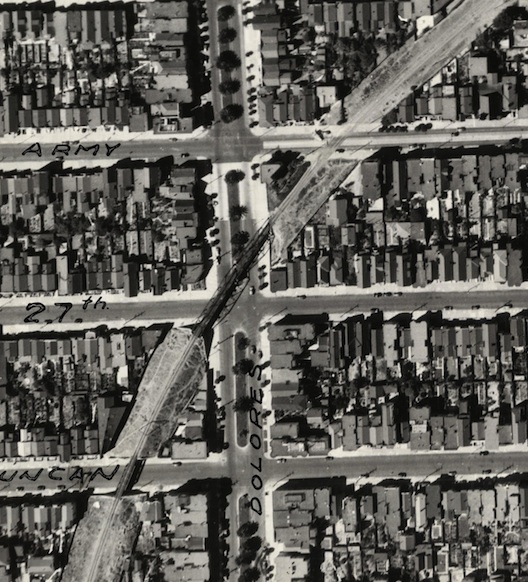 As usual with Señor Rumsey’s work, the resolution is phenomenal — it is as good as Google Maps today. And whoever hung outside an airplane with a giant camera, crisscrossing the sky of San Francisco in August of 1938, I am drinking a beer(s) in your honor right now. 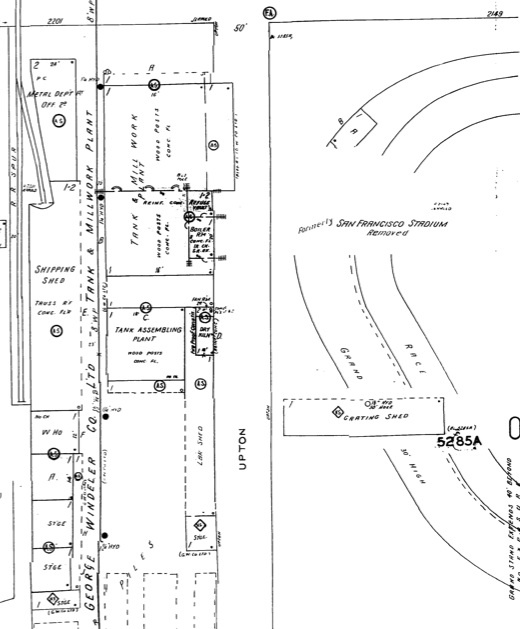 I mean, look at this: here’s the old streetcar barn that used to sit at Tiffany / Valencia / Duncan. And hey, Seals Stadium — with a game going on! Anyway, I’ll be diving into these of the next few rest of my lives. Let me know if you find anything interesting. 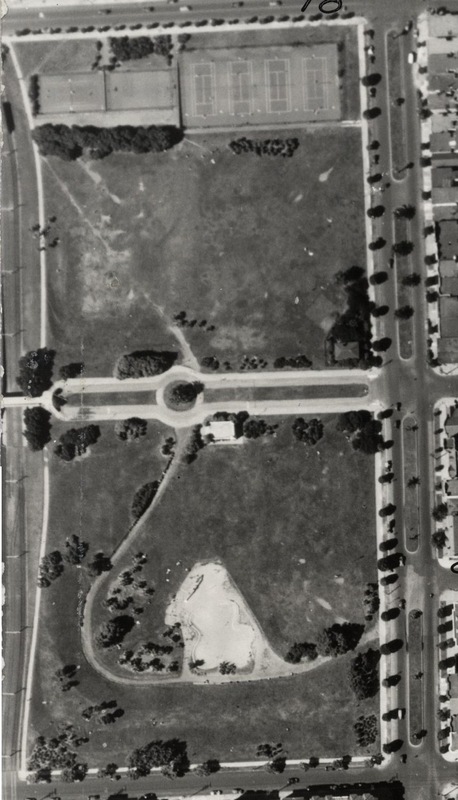 There’s also an index for your viewing pleasure – once you figure out your map number it’s easiest to search for “aerial 1938 [your map number]” in the Rumsey search box. And yes, a Google Maps layer is in the works. The thing that’s immediately jumping out at me is all the cars, block after block, parked on the sidewalks on Valencia. Doesn’t look like it was happening on other streets nearby. I was wondering about that too. But look at these SFPL photos from the 1940s (the last two in the post) — Valencia’s parking lane is definitely a lighter color — maybe concrete? Could that have something to do with the Valencia St Widening you mentioned a while back? It’s interesting to see that the entire block at Masonic and Fulton appears to be used for streetcars, where there is a Lucky’s grocery story and other things today. Now all we need is an overlay onto Google Maps. That would be beyond wonderful. Heya, that’s terrific! I’d always heard that my house had been moved to its current location in the 40s, but there it is in ’38! Incredible. I found the house I grew up in on 47th Avenue surrounded by vacant lots, and just finished studying Playland. The Shoot-the-Chutes are clearly visible. Also, finish that damn post on the Tiffany streetcar barn, please! Well crap. There goes all of my attention for anything else. This is incredible. These are ravishing. (Shipwreck graveyard in #7, shipwreck visible under the modern day coordinates of English and Lakewood St in Hunter’s Point #1-2.) Innes looks like a speakeasy riviera (just like now?). It is also incredibly how often even stray or solo houses are on standard ~30′ x ~100′ lots. What are those ghostly rectangles mixed in with the dunes on 39th Ave and Vicente (#147)? Too cool.! Can anyone identify the stadium down in Butchertown where Jerrold Ave. runs out? The lost northeast peak of Bernal was still there in 1938! You know how when you’re going east on Ripley and it’s really steep, but then it levels off at the top? It didn’t used to. And Peralta apparently ran only 3 blocks or so, all of it parallel to Precita or Army. I don’t know why they continued to call it Peralta when it was half-assedly extended south, broken up every block with footpaths and eventually stairs. I’ve had delivery drivers spend half an hour not finding my address, less than a mile away. Oops, the southern part of Peralta was a paper street on the maps long before these pictures were taken. I haven’t figured out what the stadium is. It looks like a race track. On the “Chevalier” map at David Rumsey’s (1911) that spot is still in the middle of Islais Creek. Still looks swampy in the 1923 U.S. Coast and Geodetic Survey. By 1953 (Standard Oil/H.M. Gousha map), it’s inside a large Marine Corps supply depot. Hmmm, this stadium is intriguing. Can’t find anything on the Sanborns either. Arrgggh. Scratch that, found it! There’s a “San Francisco Stadium“in the 1915-1950s Sanborns. It’s labeled as “formerly/removed”, and it’s not in the 1913-1915 set. Not finding anything in the SFPL photo archive either, but it’s a start. Cool! So if I’m reading the description right, the stadium was pasted in to the 1915 Sanborn Atlas after it was built (post 1923, assuming that map was accurate), and then the “formerly / removed” notice was pasted in on top of that when the stadium was removed, no later than 1950. It was never part of the viewshed from my apartment, built 1960. I also found the cover of a program from the mid-1930s. Will see if I can find anything in the city directories tomorrow. # 52. The railway right of way (diagonal through the Mission)! I thought it was gone much earlier than ’38. Still seen on Google in places, esp. Juri. I believe Southern Pacific officially abandoned the line in 1948. Been meaning to track the real estate boom that must have followed in th 50s. Google street shows some interesting ‘breaks’ in building styles & lot layouts… I used to walk up Osage occasionally on the way to Horace Mann; take a look between 24th & 25th (looking east). Great stuff; looking forward to more fine research. And you have to love the shot from 22nd & Harrison, looking S by SW… Angled building, a remnant of the old right of way, Twin Peaks AND the Tower as you peer down 22nd. Not to mention Atlas Stair… Hmmm. where was the old boys club? Alabama? Dude, that’s half the reason I started all this! OK, now all the East Bay peeps are JEALOUS! The online links are dead–does that mean the library is my only option for these? Historical note: That San Francisco sign on the roof is actually an airway marker of the period pointing the way to the SF Airport. They aren’t maintained anymore so there are only a handful still left in the US.